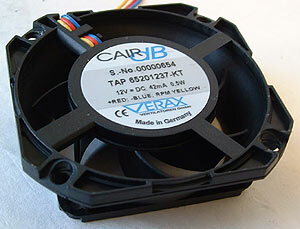 Abstract: The CAIRdB TAP65201237-KT fan rotates at between 1200RPM-3700RPM over a range of 10C-46C. The first exposure we saw of a Verax GmbH heatsink was the P14. The slightly smaller P11T is based on the same principles but employs a 65mm fan CAIRdB fan. Like the larger version on the P14, this fan is virtually silent, and based on a fairly revolutionary design that should turn the heads of even the most jaded heatsink shopper. The fan is RPM controlled by a small thermistor which is located in a supporting strut for the motor. Since this thermistor is basically bathed in the cool intake air we had to make a minor adjustment before daring to review the unit. By bending the thermistor out of its protected cavity so that it would protrude the bottom and make direct contact with the pins of the heatsink the fan was in a position to operate at full RPM when required. Without this small adjustment the fan would rotate at an RPM which was not representative of what the heatsink could really do. 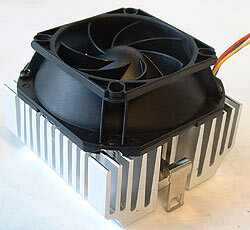 The CAIRdB TAP65201237-KT fan rotates at between 1200RPM-3700RPM over a range of 10C-46C. 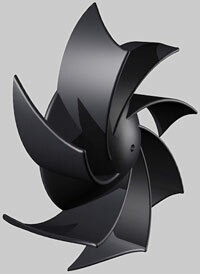 Even at the higher RPM's the fan's surprising impeller design means that noise is not an issue. The downside is that when compared to standard fans, the Verax units offer up substantially less airflow per minute. The p11T retails for about $45USD from Veraxfans.com. That is a pretty sizeable investment for a heatsink intended for use on PIII and Athlon processors (1.2GHz) given the predisposition to a lower cooling capability - but considering the absolute low-noise levels it just might be what you are looking for! 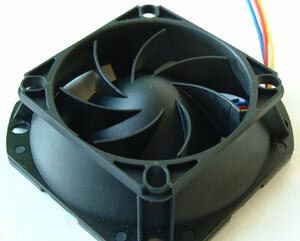 Fan Specs: CAIRdB TYP65201237-KT, 1200-3700RPM, 20CFM, 12V, 0.62A. Verax Ventilatoren GmbH of Villingen-Schwenningen Germany make one the most unique zero-noise fans in the marketplace, and accomplished this feat by tossing out convention, and starting over with a completely new impeller design. So quiet is the Verax CAIRdB fan that you literally have to hold it up to your ear to hear it - there is almost no discernible noise signature. The trade off however comes in terms of cost, and in measurably lower airflow to that of standard hi-RPM axial fans. The impeller design works by accelerating the air within the fan evenly, over a substantially longer distance than with standard axial fans. The impeller rotates counter-clockwise (backwards) - totally opposite to that of traditional axial fans.